Six-time Grammy-award winner Billy Joel has taken to designing yachts. His latest yacht, Vendetta, made a début at the 2015 Fort Lauderdale International Boat show. 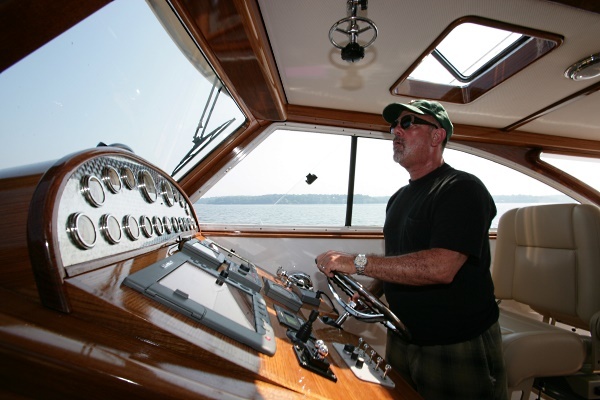 Did you know the popular American singer Billy Joel is just at home designing yachts as he is at penning hit songs? Joel first became concerned about the declining local boat building community in Long Island, USA, in the late 90s. This, combined with his frequent trips to New York City, spurred him to work with Doug Zurn and CH Marine in 2005 to create his latest design Vendetta, a commuter style yacht. Offered by Zurn Yachts, Vendetta is now in the market for $1,295,000. The 17.37 meter big sister to Joel’s previously designed The Shelter Island Runabout, Vendetta debuted at the 2015 Fort Lauderdale International Boat show as Zurn Yacht Design No. 0164. “Her appearance harks back to a bygone era of Long Island Sound commuter boats, combined with the performance and speed of The Shelter Island Runabout,” said Zurn. “She will provide a quick, smooth ride in the often short chop of Long Island Sound and the menacing Hell Gate”. The Vendetta boasts twin 1300 horsepower MAN diesels coupled to POWER-VENT Marine Drive System. A modified V-hull was created using an advanced resin infusion technique to maintain optimal strength to weight ratio. Weighing only 40,000 pounds, the yacht is able to glide across the water at a speedy 45 knots without making much noise. Vendetta has a thoughtfully-designed, well-insulated engine room. The interior of the Vendetta is an experience in itself. An enclosed cockpit holds four individual Stidd 500 Series Low Back Chairs and a twin bench seat that easily accommodates six people. The open below deck plan has a raised galley, and two settee/bunks with day bag storage just above and outboard. Natural ventilation and illumination are provided by overhead hatches, port lights and dorade vents, while air-conditioning, 24vdc lighting, and a custom built Raymarine electronics package provide every possible comfort. For more on the Vendetta, please click here. Tagged Big Boys' Toys, Billy Joel, LifeSpice, yachts. Bookmark the permalink.